Location CAF Atrium Gallery, 224 S. Michigan Ave.
What does the future hold for Chicago's iconic lakefront? The 2016 Chicago Prize asked architects, planners, designers, students and artists to ponder the limitless potential of Chicago’s eastern edge. These proposals break down barriers, blur lines and challenge assumptions of ownership and responsibility. 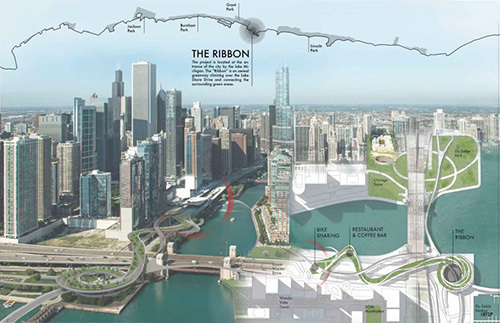 The winning entries and finalists offer ground-breaking—and sometimes fantastical—visions for the highest and best use of the lake shore. Reserved for rapid movement of vehicular traffic, Lake Shore Drive is a significant barrier for pedestrians. Grand Lattices transforms the way in which the roadway interacts with pedestrians, the city, and the lakefront. The proposal places a series of steel-frame structures in the median between the northbound and southbound lanes. At key locations, the lattices reflect the unique identity of their adjacent neighborhood, more closely uniting the urban wall to the open land beyond. Underground tunnels, which currently intend to move people through quickly, instead invite pedestrians to slow down and climb into the lattices. From here, people enjoy unique views of the lake, the city, and the roadway. The structures—inspired by Chicago's rich skyscraper history—inject humans into a space normally reserved for automobiles. Some of downtown's highest pedestrian traffic areas do not easily connect to the lakefront, limiting tourism and recreational opportunities. To help move people more effectively to and from popular lakefront sites, a series of paths unifies what are now divided lands. 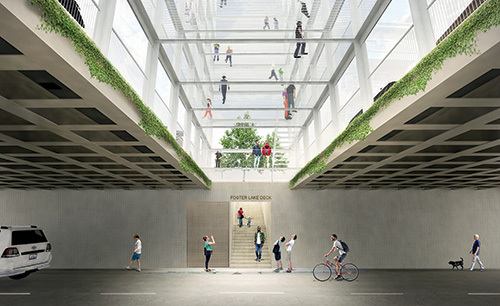 The first suspended pathway beckons pedestrians, moving them between the lakefront and the Chicago Riverwalk and Upper Wacker Drive. The second path connects bicyclists and rollerbladers between the Riverwalk and Lakefront Trail. These ribbon-like trails offer panoramic views of Chicago's diverse edge and opportunities to observe several means of transport velocities at one time. The OS Edge Network does not attempt to erase borderlines. Rather, it seeks to elevate, celebrate, and share them with more people. 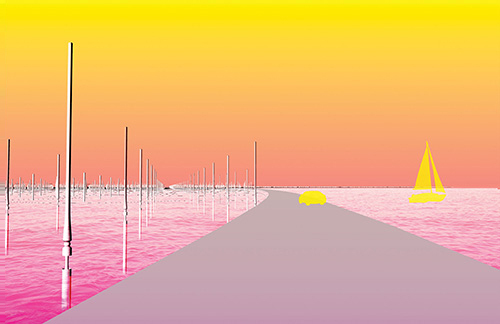 The proposal pushes Lake Shore Drive out to the furthest eastern edge and fills in the space with a grid of vertical piers. This system acts as a filter through which people view and experience the city and the horizon, thus activating the landscape. One type of pier captures kinetic energy, adding a renewable energy load that benefits the entire city. Other posts provide shelter and habitat for living creatures. A third type of pier is dedicated to recreation, inviting people to interact with the lakeshore in new ways.